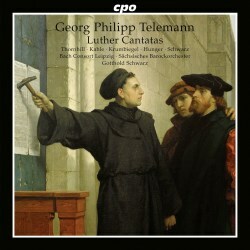 Georg Philipp Telemann composed a large number of sacred cantatas. So far only a small part of his output has been explored, which is not surprising considering its size. The present disc includes five cantatas from different stages in his career and with different textures. The title of this disc indicates what they have in common: they include stanzas from chorales whose texts and/or melodies were written by Martin Luther. The programme opens with Herr, wir liegen für dir mit unserm Gebet which is part of the annual cantata cycle of 1720, known as Concerten-Jahrgang. This was probably the last cycle which Telemann composed for the Barfüsserkirche in Frankfurt, as the next year he would take up the position of Musikdirektor in Hamburg. Like all but one cantatas on this disc its text is from the pen of Erdmann Neumeister, whose cantata libretti were also often used by Bach. This cantata is for the 6th Sunday after Trinity; the gospel reading of the day is from Jesus's Sermon on the Mount where he talks about the righteousness of the Christian in contrast to that of the scribes and Pharisees. The cantata opens with a dictum, a quotation from the Bible, here from the prophet Daniel: "O Lord, we do not present our supplications before thee for our righteousness, but for thy great mercies". This sets the tone for the cantata which is characterised by intimacy and modesty. This is reflected by the instrumental scoring for two transverse flutes, strings and bc. There are two arias which have no dacapo. In the bass aria the opening line, "Begone, ye sins, do not grieve me! ", is used as a kind of refrain which closes both sections of the aria. The Luther connection is the closing chorale, the third stanza from Mitten wir im Leben sind. So ziehet nun an als die Auserwählten Gottes is for the same Sunday and was written one year earlier. It is the only cantata on a text by a different author: Johann Friedrich Helbig who worked as secretary at the ducal court of Saxe-Eisenach and was appointed court poet in 1718. The scoring is for four voices, two recorders, two oboes with strings and bc. It ends with a stanza from Vater unser im Himmelreich, Luther's German version of the Lord's Prayer. Its content - "Lord, forgive us all our debts (...) just as we happily forgive the failings of our debtors" - is also the tenor of the cantata which is expressed in the opening dictum - from St Paul's letter to the Colossians - which talks about "humbleness of mind", "meekness" and urges the readers to forgive one another. This dictum is divided into two sections: the first is for tenor with two recorders, joined later by the strings, the first for the tutti. The two arias have a dacapo and are separated by a tenor recitative. In the B part of the soprano aria the strings vividly depict the contrasting word pairs "envy and wrath" versus "meekness and patience". The latest cantata - for the 14th Sunday after Trinity - is Es wollt uns Gott genädig sein which is part of the cycle 1742/43, when Telemann worked in Hamburg. The title refers to a chorale by Luther for which he adapted the melody of a Marian song. The chorale melody is quoted in the opening sinfonia, played by the violins, with oboes playing colla parte. The cantata comprises the three stanzas of Luther's hymn; even so Erdmann Neumeister is mentioned as the author. That can only refer to the construction of the cantata. The first stanza is first performed by the tutti and then in the form of a duet for soprano and bass on new music. The same happens with the second stanza; here the duet version is for alto and tenor. The last stanza is set only for the tutti, and the cantata ends with a fugue on "Amen". Although the scoring in the booklet mentions strings and bc with oboes ad libitum, in the second duet the violins are joined by two transverse flutes playing colla parte. As I have no access to the score I don't know whether this is based on any indication by the composer. The earliest cantata in the programme is Es spricht der Unweisen Mund wohl, from a collection called Geistliches Singen und Spielen which dates from 1710/11. At that time Telemann worked as Kapellmeister at the court in Eisenach. It is for the 8th Sunday after Trinity; the gospel reading is again from the Sermon on the Mount and includes a warning against false prophets. The cantata opens with the first stanza from the hymn by Luther: "The mouths of fools praise him whom we call the true God". In the centre is another chorale whose text was once attributed to Luther. It is notable that this cantata omits any aria: the opening chorale is followed by a recitative for alto, another chorale, a recitative for tenor followed attacca by a dictum for bass in the form of an arioso. The bass takes here the 'role' of Jesus as he quotes his words from Matthew 7, vs 21. The cantata ends with a chorus. The best-known Lutheran chorale is Ein feste Burg; this is included in the last cantata on the programme, Wertes Zion, sei getrost, which dates from the annual cycle of 1714/15 when Telemann worked in Frankfurt. It has a large instrumental scoring of three trumpets, timpani, two oboes, strings and bc. It is for the 23rd Sunday after Trinity; the gospel reading is from Matthew 22 which tells about the Pharisees' trick question to Jesus whether it is right to pay tribute to the Roman emperor. The cantata draws a parallel between the attitude of the Pharisees towards Jesus and that of the world towards his Church. It opens with a duet for soprano and bass which is followed by the first stanza of Ein feste Burg. Next follows a recitative for tenor which eloquently puts into words the meanness of the opponents of "Luther's teachings". The secco recitative turns into an accompanied recitative; the booklet gives here "soprano", but whether this is an indication in the score or an error in the booklet is impossible for me to check. This is a quite operatic piece and reminds us of Telemann's credentials as a composer of operas. The cantata continues with a dictum - a quotation from the prophet Isaiah - and a duet for alto and tenor, and closes with a "Halleluja" for the tutti. This disc attests to the variety in content and structure within Telemann's cantata oeuvre. This again shows his great versatility and creativity. It is also striking how effectively Telemann makes use of the various instrumental combinations and how well he is able to translate a text into music. The booklet doesn't say so but I think it is safe to assume that these five cantatas have been recorded here for the first time. None of the musicians disappoint and everyone has something special to offer. The music receives splendid performances here. The singers find the exact right approach to this repertoire and give the text maximum attention. Only in the tutti is it sometimes hard to understand the text, even though these are sung with just eight voices: the four soloists and four ripienists. There is only one issue which bothers me: the recitatives are too strict in time and the soloists don't take enough rhythmic freedom. I would like to make special mention of Tobias Hunger: he gives an outstanding account of the 'operatic' recitative from the last-mentioned cantata.